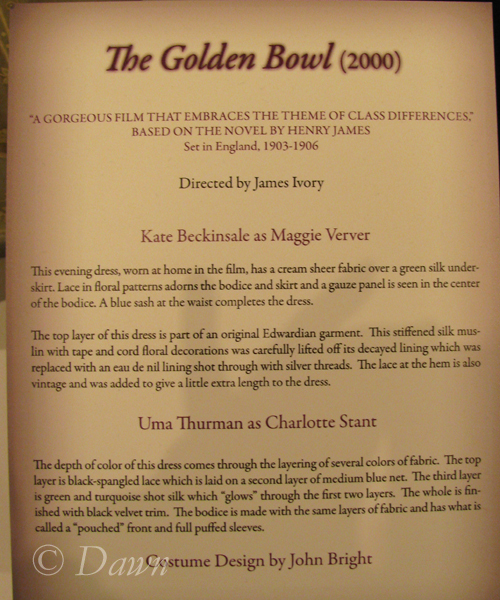 This evening dress, worn at home in the film, has a cream sheer fabric over a green silk underskirt. Lace in floral patterns adorns the bodice and skirt and a gauze panel is seen in the center of the bodice. A blue sash completes the dress. 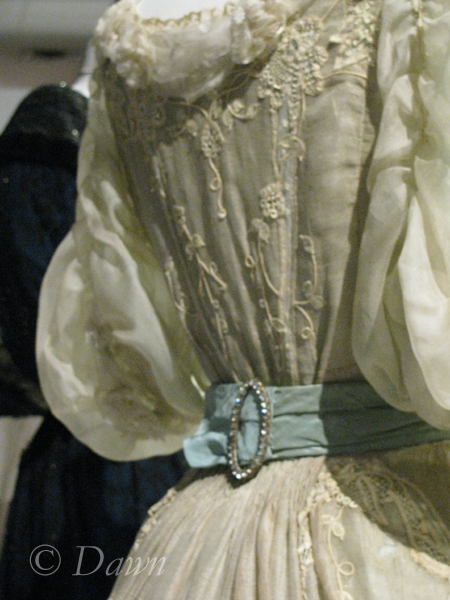 The full-length shot of the dress showing the lace fabric, the lace hem, the bloused bodice, the blue (it looks green to me) sash, and the puffed sleeves along with the necklace. 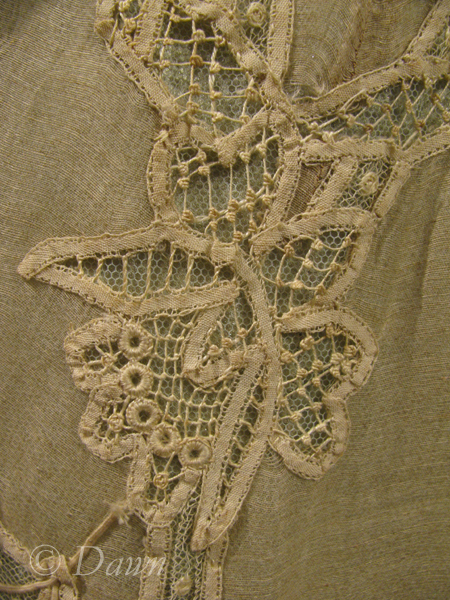 Close up of cut-work lace at the hip with green layer behind. Although I don’t care for the overall effect of the dress, I can really appreciate some of the details themselves. 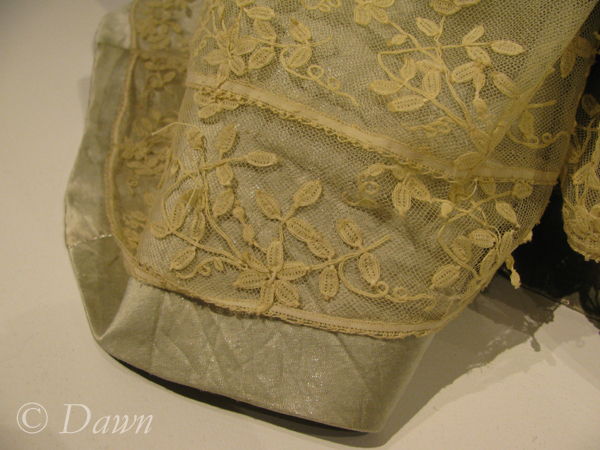 In this photo you can see the faint mint green tulle peeking through the lace. The lace is sort of battenburg-style, with tatting as well by the looks of things. These would have likely been individual motifs sewn to the fabric of the dress, and then the remaining fabric behind the motif would have been cut away. On the hem there’s a mesh fabric with lace flowers covering the same mint green tulle that backed the rest of the lace motifs, and the contrast lining fabric used for the very bottom of the hem. This fabric really looks as though it was added to allow for additional length, but I think it was well-done. I admit part of the reason I don’t care for this dress is that although there are a lot of interesting details, they all sort of fade away into one another a bit. It seems really ‘forgettable’ – which might play into the character a bit. Above is another shot of the hem, more clearly showing the tulle and all of the different fabrics and trims used at the hem. 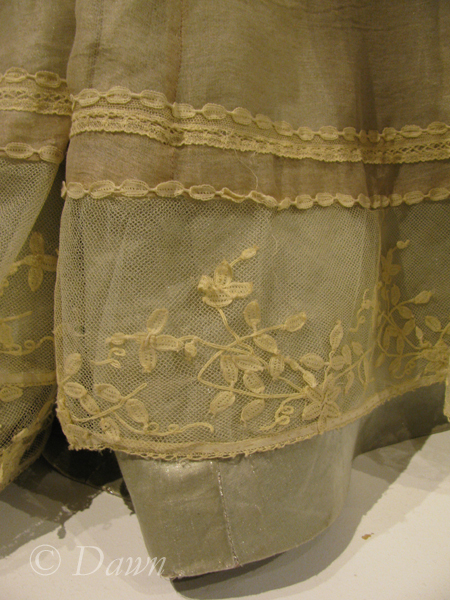 This also gives a good impression of the fabric shot with silver threads – giving that subtle sheen to the fabric that the lace doesn’t have. 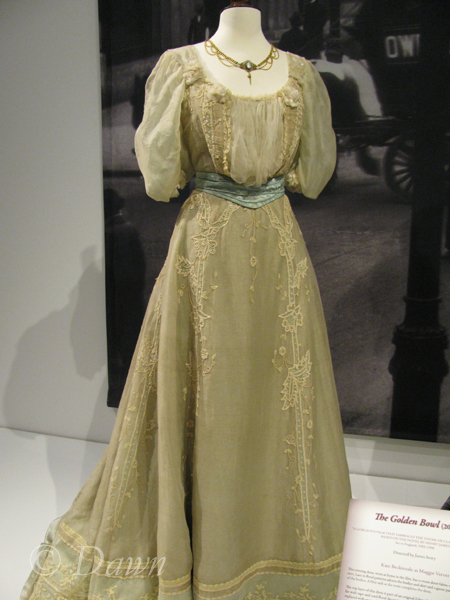 This dress is referred to as the “Sheer Cornsilk Dress” in the Costume Captures blog. Closer shot of the back, showing the belt with the rhinestone buckle. I can’t really say that I like the rhinestone buckle with this otherwise ‘soft’ dress – what do you think? 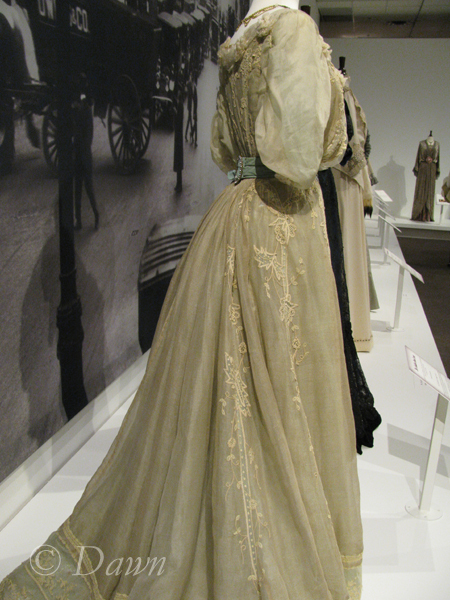 This entry was posted in Museum exhibits and tagged Edwardian, inspiration.